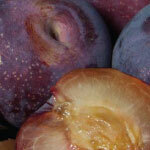 Sweet, flavorful plum, more widely adapted than Santa Rosa (more productive in coastal climates). Red-over-yellow skin, amber flesh streaked with red. Ripens June in Central Calif. 250 hours. Self-fruitful. Maroon-colored skin and flesh. Sweet, with little or no tartness and a very pleasing, mild flavor. Prolonged harvest, mid-July to mid-August in Central Calif. Very productive. Narrow, upright habit. 400 hours. Self-fruitful. Home-orchard favorite-large, heart-shaped fruit with sweet, juicy, richly flavored, firm red flesh. Dark reddish-purple mottled skin. Long harvest season-September in Central Calif. Hardy, heavy bearing. Estimated chill requirement: 500 hours or less. Pollenize with Beauty or Santa Rosa. California's commercial prune. Reddish-purple skin, dark amber flesh. Very sweet, high quality fruit-dessert/can/dry. 800 hours. Self-fruitful. European plum, later blooming than Santa Rosa and other Japanese types. Long-time favorite for dessert, cooking, canning. Tender, juicy, rich flavor. Ripens late summer. Relatively small tree. 500 hours. Self-fruitful. Large, purple-skin, freestone. Rich flavor, very sweet when fully ripe. Fresh, dried or canned. Vigorous, cold hardy tree. Late bloom. Late summer harvest. 800 hours. Self-fruitful. Medium to large reddish-purple skin, red-streaked amber flesh. Tart-sweet with rich flavor when fully ripe. Harvest about one month after Santa Rosa. Estimated chill requirement: 400 hours or less. Self-fruitful. Purplish-black skin, amber flesh. Large, firm, flattened shape. Sweet, flavorful, very little tartness at skin or pit. Favorite fresh market fruit, excellent for home orchard. Late July. 4-500 hours. Self-fruitful. Most popular plum in California & Arizona. Juicy, tangy, flavorful. Reddish-purple skin, amber flesh tinged red. Late June in Central Calif. 300 hours. Self-fruitful. Long-time favorite plum in CA. Mottled maroon over green skin, dark red meaty flesh. Sweet, mild, not tart. Excellent for jam. Harvest late July. 300 hours. Pollenized by Santa Rosa or Beauty. Striking speckled skin that is almost black and deep yellow flesh. Delicious, rich flavor. Ripens in late June. 4-600 hours. Self-fruitful. One of the most flavorful, aromatic Japanese plums when fully ripe. Beautiful 8-10 ft. tree, weeping growth habit - long slender limbs bow gracefully to the ground. Easily espaliered. Estimated chill requirement: 300 to 400 hours. Self-fruitful.